Alexa is known as one of the best shopping malls of the city. It is a one stop solution for all your entertainment needs. Alexa is a shopping mall which promises to provide you with fashion, accessories, sports and everything that you need under one roof. It has over 180 individual brands and is a great place even for some window shopping. So next time you want to take back gifts, a personally thought out one for each friend and family member of yours when you are in Berlin, then Alexa is the best place to go for that. On special Sundays, the mall is open. Check the official website for the details. Smoking is forbidden within the centre. The use of equipments like bicycle, skateboards, inlineskates or rollerskates is not allowed. Photography and filming of the centre is not allowed. Consumption of alcohol is allowed only in the dining areas. For other timing details, visit the official website. Closed on Day of German Unity. Tram lines: M4, M5, M6. People normally club together Oberbaum Bridge and Chamaleon Theater Gmbh while planning their visit to Alexa. Has a nice mix of stores, shops and boutiques. Bright, and even though usually crowded, somehow it’s got enough pathways so you don’t trip over each other. Perfect public transport. Central to Berlin’s east. Great Berlin mall. You can even go to supermarket here. There are good selection of store too. I just lunched once here and I didn't like but you can try others restaurants. A good place to go if you want to find all you need in one mall. One of the nicer malls in Berlin. The foodcourt should improve. 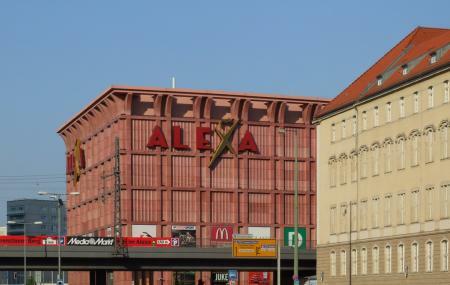 Decent shopping mall very closely located to a popular tourist attraction as in Alexanderplatz. I liked that it had shops that catered to all needs in terms of age groups. And I liked the food court. A very nice mall and well designed. Alexa has many well known stores. You don't feel it is too crowded. The mall has jacket storage for easy shopping. Food court has been renovated and now has more sitting options. There is also outdoor sitting, without so many available sits.